Family owned & operated for over 19 years! Check our reviews at Google! This 2013 Honda Civic EX just arrived. It is scheduled for clean up and service. 60 photos and mechanical services rendered will be posted shortly. 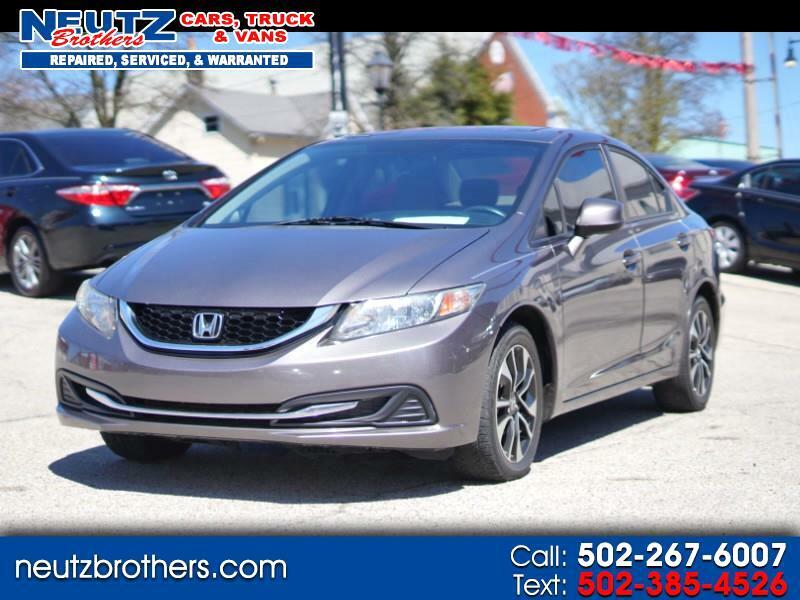 This is a very nice, clean 2013 Honda Civic EX (Bluetooth, Back Up Camera, Sunroof) in excellent condition (CLEAN AUTO CHECK / CARFAX / TWO OWNERS). It has an alarm, remote keyless entry, bluetooth, sunroof and a back up camera. Oil and filter were recently changed. We replaced all (4) tires, wiper blades, air filter, cabin filter, transmission fluid, driver s front wheel bearing, front brake pads, cut/turned both front brake rotors and we serviced (evacuated & recharged the entire system. Routine maintenance) the A/C system ($1000 - $1200 value). There is about 70% left on the rear brake pads. The spark plugs, serpentine belt, battery and coolant (-34 degrees) are all in good condition. The A/C system is putting out very cold air and is under warranty for any potential leaks. This vehicle comes with a 6 month or 6000 mile power train warranty (engine & transmission). We cover check engine lights for the first seven days after purchase and any obvious external fluid leaks for the first thirty days after purchase. We have over 200 Five Star Reviews and Cars.com. Family owned & operated for over 19 years. We take pride in providing quality vehicles and excellent customer service. Zero sales pressure, no haggling. Enjoy your shopping experience. Every vehicle is completely serviced (mechanically) and personal test driven by one of the Owners (before it is sold) to ensure quality. Approximately 80% of our business is repeat or referral. You are welcome to contact us directly at 502-267-6007 or text 502-664-4433. We can assist with financing (primary & secondary). Thanks for your time. Hope 2019 is Happy & Healthy for you and your family.